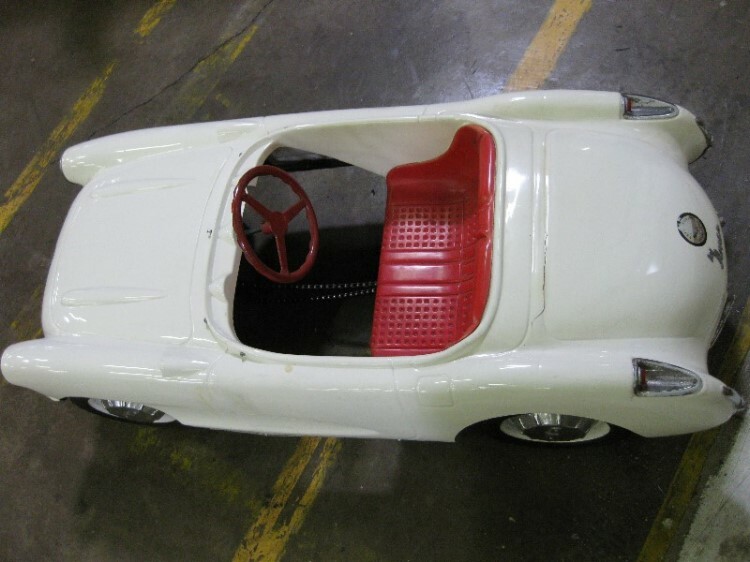 In 1956, General Motors Corporation awarded The Eska Company of Dubuque, Iowa a contract to produce 1/3 size pedal car replicas of their recently redesigned Chevrolet Corvette. Like the full-size car, the smaller, "Kiddie" version featured a molded, almost dent proof, plastic body as well as a real chrome trimmed two-speed transmission and an authentic Corvette colors of white with red interior. With help from GM's Styling department, Eska scaled down the real car's dimensions and the "mini Vette" was said by some at the time to be "dead on" for its dimensions relative to the real thing. These cars were made primarily for dealerships and promotions and were not available to the general public so there is no exact count on how many were produced, could have been as low as 200 or as many as 2000. There is so little information available regarding the car but some of the events reportedly using these pedi-powered racers were the 1956 Chevrolet Featurama and the NASCAR Speed Week Performance Trials in Daytona Beach, Florida where children could participate in races for a chance to win a "Kiddie Corvette" of their own and, on a National note, the cars were featured on "The Dinah Shore Show" as part of the "See the USA in Your Chevrolet" contest. As a side note, albeit most components of this car appear to be from the Eska Company, the chain drive is not an original Eska part and leads us to believe that at some point in time this car was either retrofitted with the drive parts or this is a "morph" of a vehicle from both Eska as well as another manufacturer that bought and used Eska parts to sell less expensive versions of the original. Exact one-third scale replica of the famous Chevrolet Corvette - designed for three-to-eight-year olds! • Super-sturdy molded plastic body won't chip, bend or dent - takes years of hard play! • "Big Car" shifting fun! Goes into high and low speed with realistic Corvette shift! • Pedal-driven two-speed transmission is wholly enclosed...connects to whisper-quiet nylon beveled gears! • Rugged, built-to-take-it frame is heavy duty tubular steel. Ball bearings in rear axle supports increased roadability. • Steering made safe and easy with special control. Finger-grip die cast steering wheel for extra driving ease. • Windshield is tough, safety-wise clear plastic with protective chrome edging! • Heavy gauge metal wheels with precision ball bearings support 10 x 1.75 semi-pneumatic tires...give smooth, sports car performance. • Authentically Corvette-styled in every detail - inside and out! From bucket-type seats to real chrome trim, this junior-size beauty authentically duplicates the famous Corvette sports car! • Features authentic, popular Corvette colors! Gleaming impregnated white plastic with red interior duplicates a favorite color combination of actual Corvette. eska toy forum How many 1956 corvette pedal cars did ESKA produce for General Motors? How many more were produced in 1957 and were all of them excusively produced for GM? 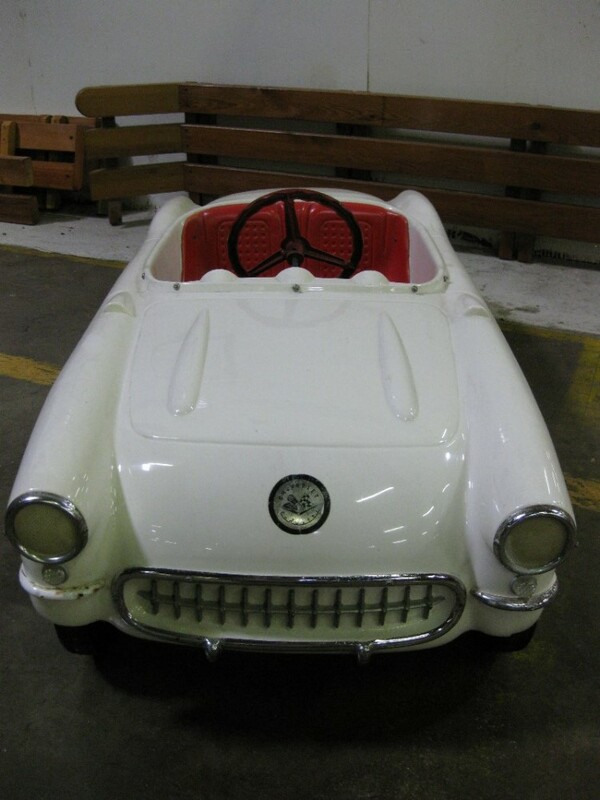 The pedal car you are asking about is called the "Kiddie Corvette". It was manufactured by The Eska Company of Dubuque, Iowa in 1956. 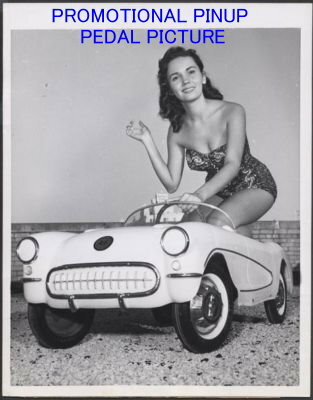 It is assumed that the company continued to manufacture the pedal car into 1957 and ceased production when the Vette was redesigned in '58 although there is no conclusive proof. 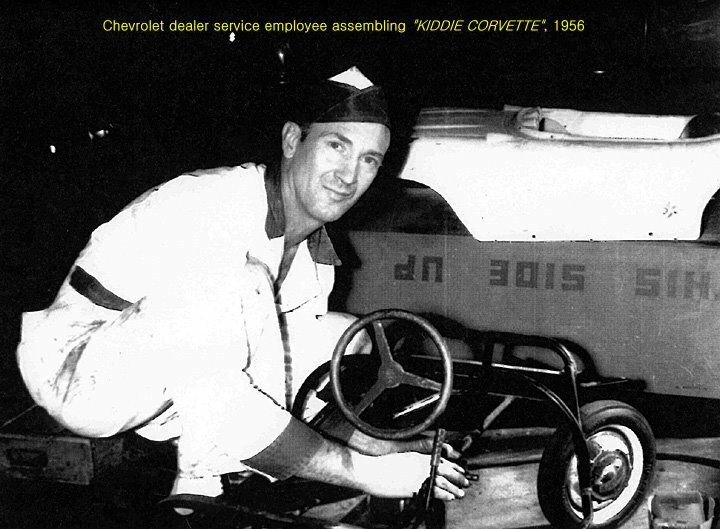 John Arnold, a model car pattern-maker for General Motors used his contacts at the GM Archives and found that 60 "Kiddie Corvettes" were awarded in the "See The USA in Your Chevrolet" national contest in 1956. He also discovered evidence of at least 13 examples being shipped on a special advertisement truck to the NASCAR Speed Week Performance Trials at Daytona Beach, Florida. 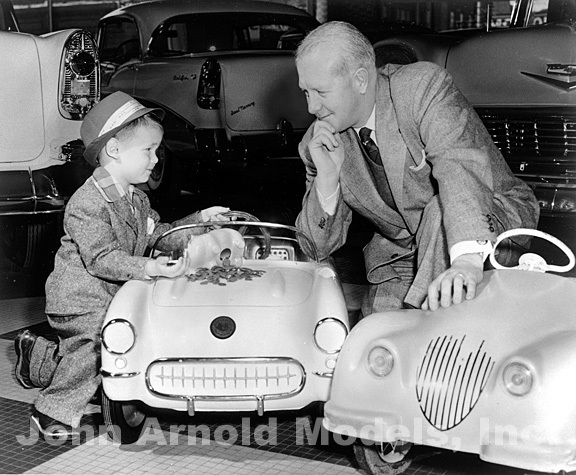 Arnold researched local newspaper adverts and articles from around the country, which lead him to believe that most Chevrolet dealers in the larger cities received as many as three "Kiddie Corvettes" for their own promotional purposes. If production of the pedal-powered Vettes continued into 1957 as suggested, the total number could be close to 300, however until company records turn up, it's a guessing game. The Eska Company, which originally manufactured boat engines and later migrated to pedal cars, went out of business in the 70's and the only vestige of that company is a tractor pedal car company called Samuleson that is located in Dyersville, Iowa that produces wheels and sells parts for all types of pedal tractors.